Moo Boo Creations is an Etsy shop which specialises in hand made garlands. There's lots of different designs, even custom ones with the lettering of your choice. I went for a love heart one! Each heart has been blanket stitched with matching coloured thread. They are then decorated with colour co-ordinated sequins which are stitched on by hand. 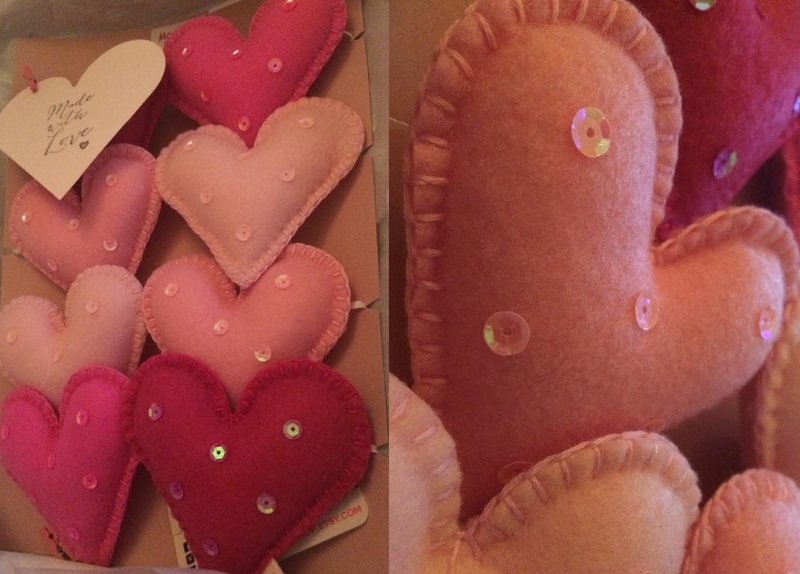 The hearts are stuffed with hobby fill which makes them look lovely and plump. They are then threaded together with white satin ribbon - you can move them as close or far apart as you like along the 2m long ribbon. I love this feature as it means that the garland can be customised to suit anyone's needs. The garland came packaged in a pretty white box tied with red and white candy striped twine and two cute little stitched hearts. Inside, the garland is wrapped in tissue paper and secured to card with cute washi tape. The packaging is absolutely superb - Katie really cares about her customers and their experience of her shop. This is admirable and I already had a huge smile on my face before I even saw the garland. Here's my beautiful garland. It's secured to the card with cute pink pegs - and all the hearts are done in varying shades of pink. Look how neatly the hearts are stitched around the edges! There's zero stuffing poking out, I don't think I've ever seen stitching as neat or consistent as this. I'm so impressed with my beautiful garland! It's very well-made - the sequins are stitched on super neatly and securely too. The hearts themselves are amazingly soft and squidgy, I'm in love. I 100% recommend that you check out Moo Boo Creations, I will post a photo once it's up in my new house.